Driveway gates can be made from a variety of materials in a wide range of designs. 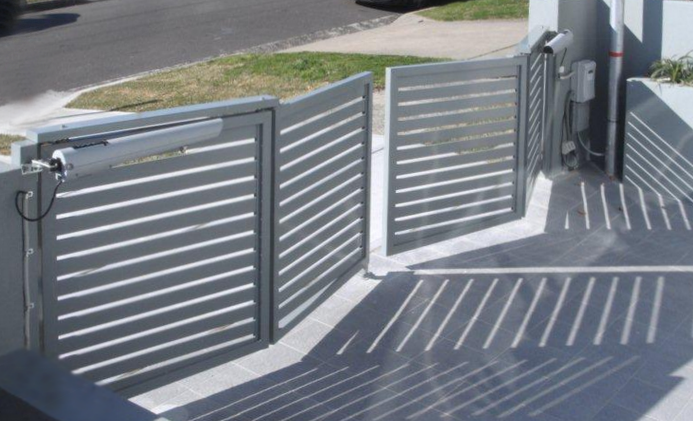 They can be swing gates, sliding gates or specialised gates where space is limited. So, here’s a rundown of the options available when considering new gates. Swing Gates or Sliding Gates? The space available for a gate to move through when opening and closing plays a big part in the selection of swing gates or sliding gates. Opening times and design preferences can also play a role, but space is the most significant limitation. Swing gates each need to be long enough to fil the space between the gate pillar or post at one side of the driveway and the mid-point of the driveway opening. This is where equally-sized swing gates meet when closed. Single swing gates will need to be long enough to fill the entire gap between pillars or posts and uneven swing gates won’t meet in the middle. But a pair of swing gates will always have one gate that is either equal to or larger than half the distance between posts or pillars. This then is the diameter of the arc the tip of the longest gate will travel through when opening and closing. This is therefore the space that must be free of obstacles to allow swing gate to open. Swing gates normally open into the property. Sometimes outward-opening swing gates are required as with a driveway that rises. However, there needs to be enough space on the property drive to avoid outward-opening swing gates from obstructing pavements or roads. These are usually a pair of gates. Sliding gates slide across the driveway opening. They move into a space to one side of one gate post that is in line with the opening and longer than the gate. This is usually a single gate. 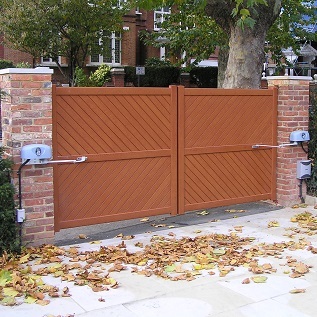 Cantilever gates work like sliding gates but avoid the need for the track across the driveway. They are balanced around the gate motor and need a counterbalance adding to the closed end of the gate. This is very noticeable and adds considerable extra length to the gate. If the space required for swing gates is unavailable, sliding gates are the first option. If the space for sliding gates is available, there are other options including bi-fold swing gates and double sliding gates, but these are more expensive options. For more information about gate options where space is limited, read this blog post on the subject. Once swing or sliding gates are chosen, gate design can be considered. A single gate will look different to double gates and have an influence on what designs look ‘right’. Sliding gates made from two gates to mimic closed swing gates are also available. Design styles are broadly ornate (iron), traditional (wood) and modern. Aluminium gates come in the widest range of styles as they can be built to mimic all designs. Gates can be made from Iron or steel, wood, aluminium or even PVC. Wooden gates will need regular maintenance to avoid issues with flaking paint or varnish, movement of the joints and ultimate rotting. Iron gates will need similar maintenance to keep rust at bay. Aluminium and PVC provide near-zero maintenance options and aluminium is the only material that provide styles and finishes that mimic iron gates and wooden gates. 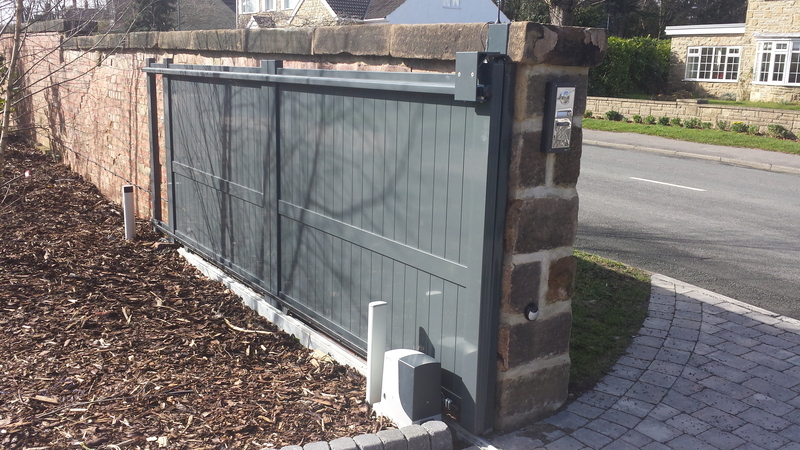 Read more about the benefits of aluminium gates over alternative materials in this blog post. Gates made of wood and materials that mimic wood, such as aluminium, are usually constructed with an outer frame and internal panels. These can be horizontal, vertical or angled infill panels. The proportion of gate that has infill panels determines if the gates are fully boarded (no gaps) or part-boarded (gaps between the infill panels). 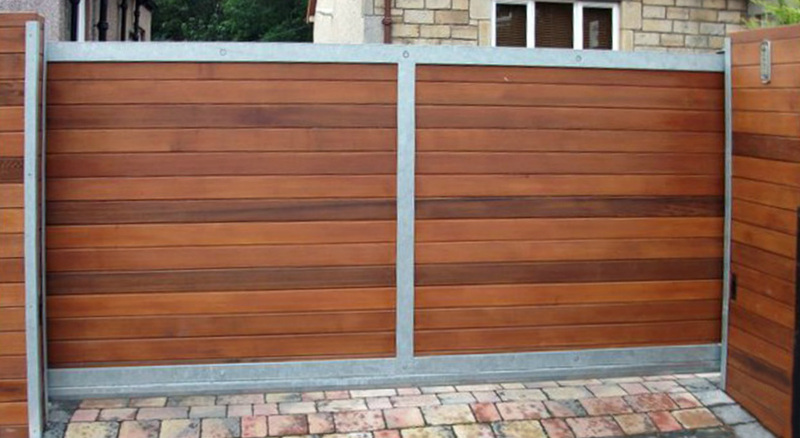 Gates can also be manufactured with sections that are part boarded and fully boarded. These are half boarded, one third boarded, two third boarded etc. See more about gate designs here. Wooden gates can be painted or varnished to try and keep the elements from affecting the wood. Aluminium gates are specified with a strong finish that is guaranteed to provide protection from the elements for ten years. This finish gives aluminium gates a wide range of coloured or wood-look finishes. House style plays a role in determining gate design choice. A traditional thatched cottage doesn’t look right with modern gates. 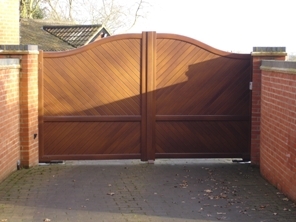 Similarly, a modern property is more suited to modern gate designs than traditional designs with a wood-look finish. Locations exposed to strong winds are more suited to open-boarded gate designs. This allows fast moving air to pass through the gate. A closed-boarded gate would require stronger motors to overcome the force of wind on the surface of the entire gate. Gate automation systems are covered briefly here, but more information is available in this blog post. Each of the different types of swing gate motor looks quite different from the rest except form rams and linear screw motors. These two are both long and thin and often roughly cylindrical. Rams differ in appearance predominantly with the inclusion of a rod that extends from the motor body to open a gate and retracts back into the body to close the gate. Linear screws use a rotating threaded shaft inside the motor casing to move the gate mounting up or down the shaft’s length. Consequently, they do not extend or contract like rams do. Swing gate underground motors are the most discrete as they’re mounted in pits below the hinges. Only the motor foundation box lid and the motor arms attached to the underside of the gate are visible. While incredibly discrete, undergrounds require careful installation and suitable drainage to prevent them from becoming submerged in water for extended periods. Possibly the most obtrusive are articulated arm motors which have a two-part linked arm connecting the gate motor to the gate. When the motor rotates, the arm follows and pulls the gate open as the articulated arm closes up. When the motor reverses, the arm rotates back into its 90 degree open position when the gate is fully open. Sliding gate motors use a track across the drive entrance, a rack mounted on the inside of the gate and a box-like motor. The motor housing has a protruding cog attached to the motor itself. This meshes with the rack and moves the gate as the motor turns the cog. For more information on any aspect of gate choice or to arrange a visit from a local gate engineers, call Linkcare, now on 01895232626.